From one of America’s iconic writers, a stunning book of electric honesty and passion. Joan Didion explores an intensely personal yet universal experience: a portrait of a marriage—and a life, in good times and bad—that will speak to anyone who has ever loved a husband or wife or child. A spare, lucid, and remarkably moving examination of the year following her husband’s sudden death just before their fortieth anniversary, The Year of Magical Thinking is the story of Didion’s search for answers, for relief, and above all for the chance to change the course of events. A spare, lucid, and remarkably moving examination of the year following her husband’s sudden death just before their fortieth anniversary, The Year of Magical Thinking is the story of Didion’s search for answers, for relief, and above all for the chance to change the course of events. Filled with often surprising insights and more than a dash of humor, it is one of the most critically acclaimed books of the decade. Joan Didion was born in California and lives in New York City. She is the author of five novels and seven previous books of nonfiction. The Year of Magical Thinking won the National Book Award and was named a New York Times Best Book of the Year. 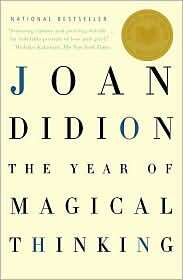 In particular, address “The question of self-pity.” Does Didion pity herself? In what ways does she indulge that impulse, and in what ways does she deny it? Discuss the notion of “magical thinking.” Have you ever experienced anything like this, after a loss or some other life-changing occurrence? How did it help, or hinder, your healing? Discuss Didion’s repetition of sentences like “For once in your life just let it go”; “I tell you that I shall not live two days”; and “Life changes in the instant.” What purpose does the repetition serve? How did your understanding of her grief change each time you reread one of these sentences? At several points in the book Didion describes her need for knowledge, whether it’s from reading medical journals or grilling the doctors at her daughter’s bedside. How do you think this helped her to cope?